It's hard, of course, to keep on top of a collection, when you're planning and promoting programs, ordering new books, and doing a thousand other things. It's even harder when you actually have shelf space, "so it's not that big of an issue right now" - but, it still needs to be done, and the longer you put it off, the more likely you are to find some embarrassing gems lingering on the shelves. 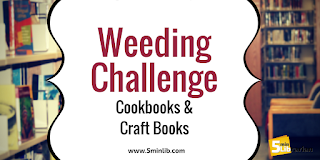 It's time, again, for a weeding challenge! The easiest way to weed is to look at circulation numbers, but sometimes the fact that a book goes out doesn't necessarily mean that it's a very good book. As we discussed in our Staying Trendy Weeding Challenge (which was two years ago?! Where does the time go? ), books will often be checked out for lack of anything better. A book about the local sports team from 15 years ago may still circulate, but it's probably a good idea to get something more current. 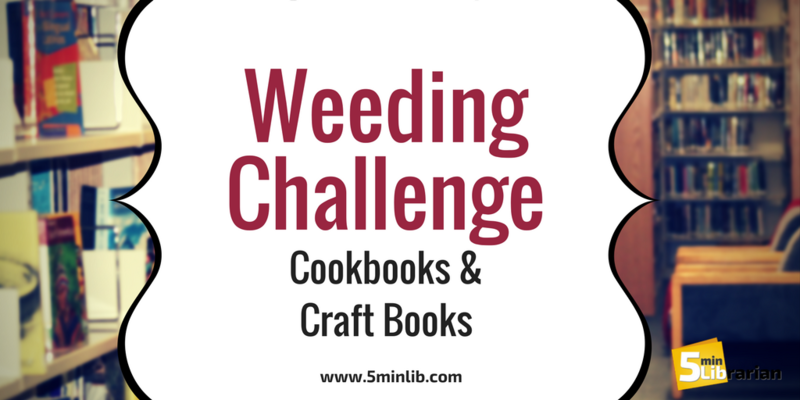 This time, let's take a look at two popular and often un-weeded sections of the library: cookbooks and craft books. "But recipes never go bad!" Oh, yes, they do. (Have you seen the Vintage Recipe Cards website?) Seriously, though, food can be as trendy as fashion, in its own way, and we must attempt to keep up with it. Also, even if a cookbook has a great cover, the insides may be dated, so be sure to take a quick flip through. Black and white or no photos - There is no excuse in this day of modern printing to have any cookbooks that don't have full-color photos of food to make your mouth water. More talking than recipes. This may be okay in some instances, but for a cookbook and not a guide to a new way of eating (vegetarian, Paleo, etc. ), this may not be a good idea. Trendy recipes or ways of eating that are no longer relevant. For example, Atkins is not the current food trend, nor is everything being low-fat. You want to buy books about clean eating, paleo, keto, or instant pot recipes instead. Books by trendy celebrities who are no longer relevant, no longer have television programs, or who have fallen out of favor (I'm sorry, Paula Deen, but after that whole incident, you're just not on top anymore). Books with food or liquid stains on them. Sure, cookbooks may get crumbs, but let's keep things as sanitary as possible! You can always reorder a book that looks well-loved. Here are some of the gems I found in my library's collection. This one is actually very cute! I like the cover and the title, and it's always a good idea to have cookbooks for teens, particularly when they're learning how to eat healthy and deciding on their own moral compasses. The problems: Firstly, this isn't actually a guide for teen vegetarians, but for the parents of teens who have decided to go vegetarian. Which is all well and good, but with this title and cover, it's missing that demographic entirely. Secondly, as we discussed above, there is a lot of talking and not as much in the way of cooking. The first 91 pages are all talking before we even get to the recipes. And then - no pictures. Especially for vegetable recipes (as opposed to, say, cookies), you really want photos that make the food look as appealing as possible, and there are none. This one has to go. This book is now 30 years old, and Dom DeLuise passed away in 2009. Had he been a chef, we might want to keep his books on the shelf (I'm not saying you should get rid of your Julia Child books! ), but since he was a comedic actor who happened to have a cookbook, his drop in popularity may mean we can reconsider this title. In addition, while some of the recipes have photos, most of the photos include Mr. DeLuise posing with the food, rather than just the food itself. It's your call here, but I am weeding this one. This cookbook actually has fantastic reviews, and contains holiday cookie and dessert recipes from around the world. Unfortunately, it hasn't circulated in a few years, and there are no photos (color or otherwise) in this book. Maybe someone will make a newer version of this! In the meanwhile, it's time to weed it. Weight Watchers has been around for a long time, and is still quite popular. However, their eating plans change every few years, and the Quick Start Program hasn't been used since the 1990s. (They switched to Points in 1997, PointsPlus in 2010, and SmartPoints in 2015. If you have any Weight Watchers SmartPoints cookbooks, you have the current editions.) In addition, this book also doesn't have any photos. It's time to upgrade. Craft books can be extremely trendy, in their own way - especially the ones with creating jewelry or items for your home. Black and white or no photos - with crafting, when the end result is a visual product, there is no reason not to have color photos of what you're creating. Books by trendy celebrities who are no longer relevant, no longer have television programs, or who have fallen out of favor (the Hannah Montana How To Be a Rockstar: My Secret Superstar Style book can go now). Books with trends that are no longer popular, such as macrame (though often-times these trends come back! Just look at the BeDazzler - everything is jewel-encrusted again). I almost passed this one by. Crocheting never gets old! But then I looked inside, and pulled it. Take a look at this page: Would this help you learn a new stitch? Small black and white illustrations, and someone attempting to explain what they're doing? Or would you rather have actual photos? Me,too. I'm not saying that having a braided rug in your home is not fashionable, but I am saying that a home decorating trend from 1977 may be inadvisable to have on your shelf. Weddings! Everyone loves weddings, and also saving money. It's a bit old, but it's not that bad, right? Yes. Yes, it is. Firstly, it's from 1995, which may seem like only a couple years ago, but it was actually 23 years ago. (Let that sink in. If it was a person, this book would be old enough to drink its own champagne.) Fashions and styles have changed a bit since then. Also, the images inside are all black and white line drawings - probably not the best for a book on decorating. It's time to get something new. This one may be a bit controversial, because these books still do circulate a bit, but hear me out. In my opinion, books on crafting should always have photographs instead of illustrations. It's hard to know exactly what you're trying to create if you don't have a photo. BUT - the ideas are cute, and if it still circulates, I'd keep this one on the shelf. Even the best-kept libraries will have weeding to do, so there's no shame in finding some clunkers on the shelves (it happens to the best of us!). Weeding can be fabulous fun, and getting rid of things is the best way to make room for some shiny new titles, and to make it easier to see some of the gems on your shelves that may be lost in the clutter. Let us know what your favorite weed is that you found in your collection by commenting here, on our Facebook page, or on Twitter.